Use this screensaver to relax and unwind from work at the computer. Listen to the sounds of pure rough mountain river. Download free nature screensaver and use it absolutely free! Mountain Rivers - is our new, high-quality screensaver. Living realistic animation is based on the movie, especially for people not having the ability to escape to nature or wanting to remember summer winter evenings. Use this screensaver to relax and unwind from work at the computer. 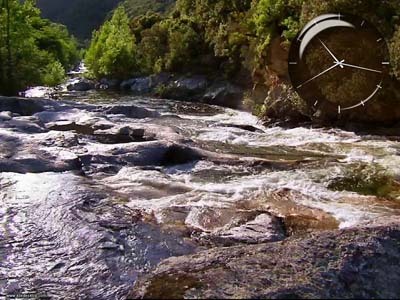 Listen to the sounds of pure rough mountain river. Download free nature screensaver and use it absolutely free! Install this screensaver on your PC and dive into the unique charm of Christmas and New Year holidays. You will find Christmas candles in the frame of the Christmas tinsel, gifts on the window, snowman, snow drifts, and the Christmas tree with toys. The Lake Screen Saver simulates peaceful water wave in a beautiful autumn scene. All parameters can be adjusted in the compact user interface. Turn your desktop into a spectacular ocean aquarium full of tropical fish swimming around your icons. Enjoy the schools of photo-realistic tropical fish, relaxing sounds, animated bubbles & sunlight streaming down the murky waters of your screen. Fich3D is a new screensaver of sea nature from a collection of new free screensavers from http://www.newfreescreensavers.com. A striped fish float across the monitor changing pictures on sea theme. It's safe to install and run. No spy/adware.